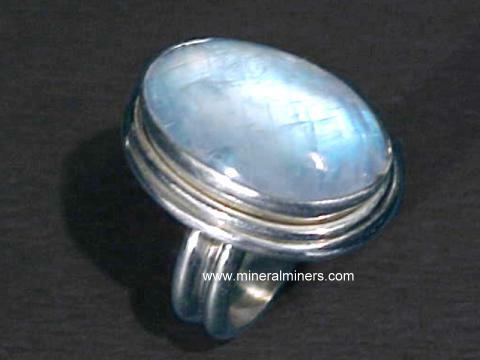 Try our Moonstone Jewelry Satisfaction Guarantee - compare our moonstone prices and our superior quality. Click on any moonstone jewelry image below to enlarge it. Moonstone earrings with cabochon gems weighing 4 carats total weight ! These genuine moonstone earrings were handcrafted in 925 sterling silver and bezel set with a 9x7mm oval shape cabochon gemstone of natural blue-flash moonstone. These beautiful moonstones are semi-transparent to transparent. Each of these moonstone gems weighs 2 carats (4 carats total weight moonstone gems), and they are both unheated and untreated. Moonstone earrings with cabochon gems weighing 5 carats total weight ! These genuine moonstone earrings were handcrafted in 925 sterling silver and bezel set with an 8mm round shape cabochon gemstone of natural blue-flash moonstone. These beautiful moonstones are semi-transparent to transparent. See also another view of these natural moonstone earrings. Each of these moonstone gems weighs 2.5 carats (5 carats total weight moonstone gems), and they are both unheated and untreated. These genuine moonstone earrings were handcrafted in 925 sterling silver and bezel set with a 12x6mm marquis shape cabochon gemstone of natural blue-flash moonstone. These beautiful moonstones are semi-transparent to transparent. See also another view of these natural moonstone earrings. Each of these moonstone gems weighs 2.5 carats (5 carats total weight moonstone gems), and they are both unheated and untreated. Natural moonstone earrings with 6.5 carats total weight moonstone gems! These genuine moonstone earrings were handcrafted in 925 sterling silver and set with semi-transparent cabochon gems of natural moonstone. Each of these genuine moonstone gems is unheated and untreated, and each earring is 1.65 inches long, including the hoop. These large size genuine moonstone earrings were handcrafted in 925 sterling silver and each set with a semi-transparent 10mm round cabochon gemstone of natural blue flash moonstone, and also with five 4mm round faceted gems of natural color amethyst. 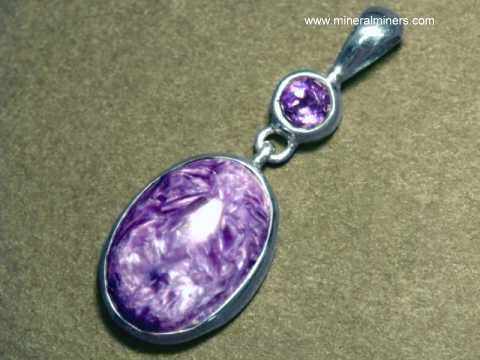 Each of the amethyst and moonstone gems is unheated and untreated. This heavy moonstone bracelet of solid 925 sterling silver was handcrafted with a one inch wide band at the top. This natural moonstone jewelry design is set with 23 cabochon gemstones of natural blue-flash moonstone! 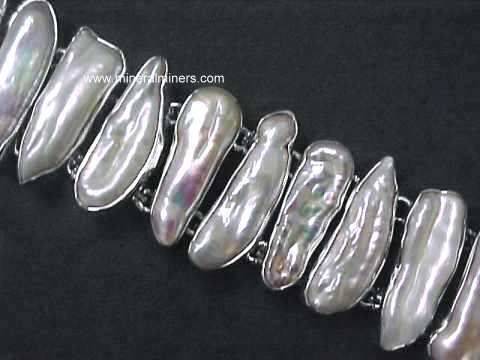 This beautiful handcrafted moonstone bracelet fits on wrist sizes from 6.75 inches to 8 inches around. see also another view of this genuine moonstone bracelet. This lovely moonstone bracelet is set with seven pear shaped cabochon gemstones of 100% natural moonstone, each measuring 10x7mm. This genuine moonstone jewelry design is handcrafted in sterling silver. The photo at left shows a close-up photo. See also a full view of this natural moonstone jewelry design. This lovely moonstone bracelet is set with nine square shaped cabochon gemstones of 100% natural moonstone, each measuring 7mm across. This genuine moonstone jewelry design is handcrafted in 925 sterling silver. The photo at left shows a close-up photo. See also a full view of this handcrafted moonstone bracelet. This handcrafted moonstone bracelet is set with five square shaped cabochon gemstones of natural moonstone, each measuring 6mm across, and with five pear shape faceted gems of sky blue topaz measuring 11x8mm each. This genuine moonstone jewelry design is handcrafted in 925 sterling silver. The photo at left shows a close-up photo. See also a full view of this handcrafted moonstone bracelet. This natural color moonstone bracelet has 82 carats of moonstone cabochon gems! This unique moonstone bracelet is set with six cabochon gemstones of 100% natural moonstone with beautiful blue and golden-green flashes of natural iridescent color. These genuine moonstones range in size from 18x11mm up to 20x13mm in a variety of shapes. This genuine moonstone jewelry design was handcrafted in 925 sterling silver with open back settings. The photo at left shows a close-up photo, see also a full view of this genuine moonstone bracelet. This natural color moonstone bracelet has 86 carats of moonstone cabochon gems! This unique moonstone bracelet is set with six cabochon gemstones of 100% natural moonstone with beautiful blue and golden green flashes of natural iridescent color. These genuine moonstones range in size from 16x12mm up to 23x18mm in a variety of shapes. This natural moonstone jewelry design was handcrafted in 925 sterling silver with open back settings. The photo at left shows a close-up photo, see also a full view of this genuine moonstone bracelet. This natural color moonstone bracelet has 52 carats of moonstone cabochon gems! This unique moonstone bracelet is set with eight cabochon gemstones of 100% natural moonstone with beautiful blue and golden green flashes of natural iridescent color. These pear shaped moonstones range in size from 14x8mm up to 17x9mm. This genuine moonstone jewelry design was handcrafted in 925 sterling silver with open back settings. The photo at left shows a close-up photo, see also a full view of this genuine moonstone bracelet. This natural color moonstone bracelet has 96 carats of moonstone cabochon gems! This beautiful moonstone bracelet is set with seven cabochon gemstones of 100% natural moonstone with beautiful blue flashes of natural iridescent color! These genuine moonstones range in size from 18x10mm pear shape cabochons at each end of the bracelet, on up to a 20mm square moonstone cabochon in the center of the bracelet! This genuine moonstone jewelry design was handcrafted in 925 sterling silver with open back settings. The photo at left shows a close-up photo, see also a full view of this unique moonstone bracelet. This moonstone bracelet has 142 carats of moonstone cabochon gems! This unique moonstone bracelet is set with seven large oval shaped cabochon gemstones of natural moonstone. These beautiful moonstone cabs measure 20x12mm at each end and increase towards the middle on up to 31x15mm in the center of the bracelet. This genuine moonstone bracelet was handcrafted in 925 sterling silver. The photo at left shows a close-up photo, see also a full view of this extra large size moonstone bracelet. This moonstone bracelet has 146 carats of moonstone cabochon gems! This unique moonstone bracelet is set with seven large cabochon gemstones of natural moonstone. 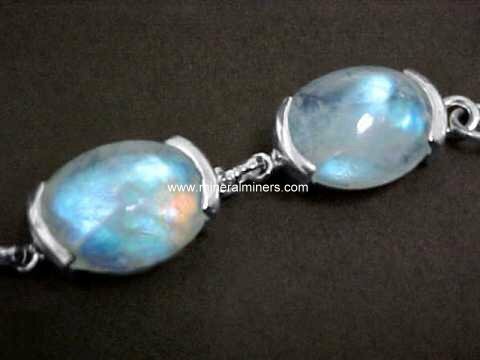 These amazing moonstones measure from 27x10mm up to 32x11mm. This genuine moonstone bracelet was handcrafted in 925 sterling silver. The photo at left shows a close-up photo, see also a full view of this extra large size natural moonstone jewelry design. This genuine moonstone ring was hand-crafted in 925 sterling silver and set with a cabochon gem of natural color blue-green moonstone. The 16x13mm pear shape cabochon gem in this genuine moonstone jewelry design was hand-ground & polished from natural moonstone rough mined in India. This large moonstone ring was hand-crafted in 925 sterling silver and set with a cabochon gem of natural color rainbow moonstone with wonderful blue-green and gold flashes of color. The 20x15mm oval shape cabochon gem in this genuine moonstone jewelry design was hand-ground & polished from natural moonstone rough mined in India. This unique moonstone ring is set with a 20x10mm marquis shape cabochon gem of natural moonstone. This genuine moonstone jewelry design was handcrafted in 925 sterling silver. This beautiful moonstone ring is set with a 16x8mm marquis shape cabochon gem of natural color moonstone, and with a 4mm round faceted gem of natural color green tourmaline. This genuine moonstone jewelry design was handcrafted in 925 sterling silver. See also another view of this natural moonstone ring. This moonstone ring is set with a 26x12mm marquis shape cabochon gem of natural rainbow moonstone. This genuine moonstone jewelry design was handcrafted in 925 sterling silver. This large moonstone ring is set with a 25x14mm pear shape cabochon gem of natural color moonstone with flashes of blue and green colors at different angles. This unique moonstone jewelry design was handcrafted in 925 sterling silver in a ring style suitable for a man or a woman. See also another view of this natural moonstone ring. This large moonstone ring is set with a 26x15mm oval cabochon gem of natural color moonstone with flashes of blue, green and gold colors at different angles. This unique moonstone jewelry design was handcrafted in 925 sterling silver in a ring style suitable for a man or a woman. See also another view of this natural moonstone ring. This large moonstone ring is set with a 22x16mm half-moon shaped cabochon gem of natural color rainbow moonstone with flashes of blue and gold colors at different angles. This unique moonstone jewelry design was handcrafted in 925 sterling silver in a ring style suitable for a man or a woman. See also another view of this natural moonstone ring. This wonderful champagne moonstone ring was hand-crafted in 925 sterling silver and set with a high-dome cabochon gem of silvery-peach natural color cats eye moonstone! The 14x11mm gem in this natural moonstone jewelry design was hand-ground & polished from 100% natural champagne moonstone rough mined in India. This unique moonstone ring is a ring size 6 1/2. See also a side view photo of this natural cats eye moonstone jewelry design. Natural moonstone ring is set with a fine cats eye gem weighing 19 carats! This large champagne moonstone ring was hand-crafted in 925 sterling silver and set with a fine quality gem of pale silvery peach natural color cats eye moonstone. The 19x14mm cabochon gem in this natural moonstone jewelry design was hand-ground & polished from natural untreated champagne moonstone rough that was mined in India. This genuine moonstone necklace was hand-crafted in 925 sterling silver and each moonstone gem was bezel set with an open back setting. This one-of-a-kind moonstone necklace has seven pear shape rainbow moonstone gems measuring from 13x7mm up to 25x11mm. 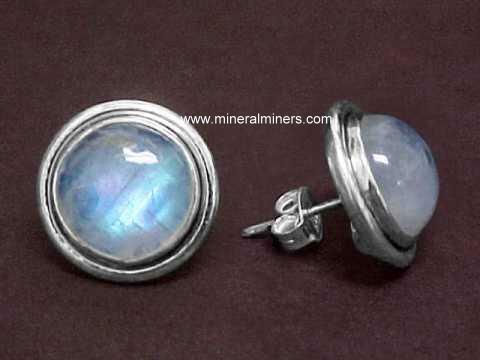 These genuine moonstone gems are completely natural, they have not been heated or treated in any way. See another close-up of this unique moonstone necklace. See also a full view of this handcrafted moonstone necklace. This beautiful moonstone necklace will make a very nice gift! This genuine moonstone necklace was hand-crafted in 925 sterling silver and each moonstone gem was bezel set with an open back setting. This one-of-a-kind moonstone necklace has six beautiful oval shaped rainbow moonstones measuring from 18x13mm up to 22x16mm, and the amazing centerstone is a 29x20mm pear shape rainbow moonstone cabochon. 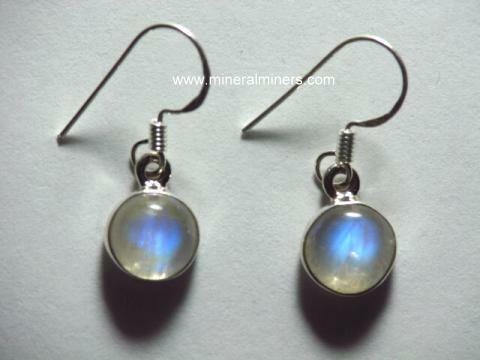 These genuine moonstone gems are completely natural, they have not been heated or treated in any way. The photo at left shows a close up photo. See also a full view of this handcrafted moonstone necklace. Extra Large Moonstone Necklace with Black Onyx! This extra large size moonstone necklace was hand-crafted in 925 sterling silver! This one-of-a-kind necklace has open back settings underneath seven semi-transparent faceted gems of natural blue-flash moonstone which measure from 11x8mm up to 14x9mm. This genuine moonstone jewelry design is also set with fourteen checkerboard-top faceted gemstones of black onyx! The photo at left shows a close up photo. See also a full view of this handcrafted moonstone jewelry design. This moonstone pendant was hand-crafted in 925 sterling silver and also set with three pink tourmaline cabochon gemstones. This pendant has open back settings underneath the gems. 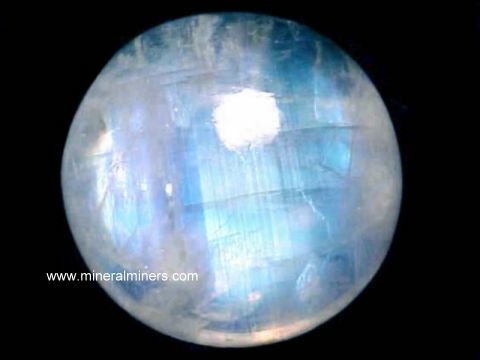 The natural blue-flash moonstone gem measures 14x10mm. This natural moonstone pendant was hand-crafted in 925 sterling silver and also set with a 10x6mm natural color blue kyanite cabochon gemstone. This pendant has open back settings underneath the gems. The natural color blue-flash moonstone gems are a 17x9mm pear shape gem at the bottom, and a 9mm round blue-flash moonstone gem at the top. Strung with 110 carats of natural moonstone faceted beads! Semi-transparent natural white moonstone pieces mined in India with occasional flashes of beautiful blue & rainbow colors were hand-ground into disc shaped beads & faceted. They were then drilled and strung in this faceted moonstone necklace and fit with a sterling silver extender chain & clasp. These moonstone beads are all completely natural, they have not been heated or treated in any way. See also a full view of this faceted moonstone necklace. We have this genuine moonstone necklace available with 6mm bead diameters. This wonderful moonstone necklace with matching earrings has faceted beads of semi-transparent natural white moonstone that was mined in India with occasional flashes of beautiful blue & rainbow colors. Each bead in the necklace was hand-ground & faceted and then drilled and strung into this 45cm (18 inch) faceted moonstone necklace with a sterling silver clasp. The beads in this natural moonstone necklace are gradational in size with the largest beads at the center of the necklace measuring 9mm long. The photo at left shows a close-up view, see a full-view of this faceted moonstone necklace together with the matching handcrafted moonstone earrings. See also a close-up of the faceted moonstone earrings in sterling silver studs. Natural white moonstone pieces from India with beautiful blue flashes of color and superior transparency were tumbled and polished in baroque shapes, and then drilled and strung in this 36" (91cm) "endless" moonstone necklace. There are approximately 350 drilled baroque shape beads in each of these natural moonstone necklaces! The photo at left shows a close-up view. See also a full view of this 36 inch genuine moonstone necklace. These genuine moonstone necklaces with baroque shaped beads make great gifts! We also have baroque bead gemstone necklaces available in amethyst jewelry and amethyst necklaces, apatite jewelry, green aventurine jewelry, agate necklaces, citrine necklaces, red garnet jewelry and garnet necklaces, labradorite necklaces, lapis lazuli jewelry and lapis lazuli necklaces, peridot necklaces, rock crystal necklaces, rose quartz jewelry, smoky quartz jewelry, tanzanite necklaces, tourmaline necklaces, and much more! Moonstone Necklace with Drop Shaped Beads, 18"
Natural white moonstone pieces from India with occasional flashes of beautiful blue color and superior transparency were hand-ground and polished into drop-like shapes, and then drilled and strung into this 18 inch long natural moonstone necklace with a sterling silver clasp. The photo at left shows a close-up view of these drop shape moonstone beads, see also a full view of this genuine moonstone necklace. Natural white moonstone pieces from India with beautiful blue flashes of color and superior transparency were tumbled and polished in baroque shapes, and then drilled and strung in this 45cm (18 inch) natural moonstone necklace with a sterling silver clasp. There are approximately 200 drilled baroque beads in each of these beautiful moonstone necklaces! See also a full view of this genuine moonstone necklace. This genuine moonstone pendant is set with nine cabochon gems of natural blue-flash moonstone and rainbow moonstone in oval, round and marquis shapes measuring from 7x5mm up to 12x6mm. This natural moonstone multi-gem pendant will make a wonderful moonstone necklace! This genuine moonstone jewelry design was crafted entirely by hand with open back settings in 925 sterling silver. This genuine moonstone jewelry pendant was handcrafted in 925 sterling silver and set with a pear shaped 16x12mm cabochon gemstone of natural blue-flash moonstone. It will make a wonderful moonstone necklace! The photo at left was taken under incandescent light. This natural moonstone pendant is set with a pear shape natural color rainbow moonstone cabochon gem measuring 24x14mm. This genuine rainbow moonstone jewelry design was handcrafted with an open back setting in 925 sterling silver. This natural moonstone pendant is set with a marquis shape natural color rainbow moonstone cabochon gem measuring 25x13mm. This genuine rainbow moonstone jewelry design was handcrafted in 925 sterling silver. This natural moonstone pendant is set with a superior quality transparent natural color rainbow moonstone cabochon gem. 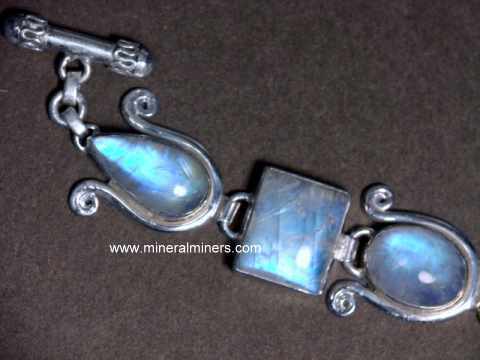 This lightly included moonstone measures 32x11mm. This genuine rainbow moonstone jewelry design was handcrafted with an open back setting in 925 sterling silver. This natural moonstone pendant is set with a triangular shape natural color rainbow moonstone cabochon gem measuring 24x19mm. This genuine rainbow moonstone jewelry design was handcrafted with an open back setting in 925 sterling silver. This natural moonstone pendant is set with a superior quality transparent natural color moonstone cabochon gem. This lightly included moonstone measures 20x15mm. This genuine moonstone jewelry design was handcrafted with an open back setting in 925 sterling silver. This natural moonstone pendant is set with a natural color rainbow moonstone cabochon gem measuring 28x18mm. This genuine rainbow moonstone jewelry design was handcrafted with an open back setting in 925 sterling silver. This natural moonstone pendant is set with an ova shape natural color rainbow moonstone cabochon gem measuring 22x17mm. This genuine rainbow moonstone jewelry design was handcrafted with an open back setting in 925 sterling silver. This genuine moonstone pendant is set with a very beautiful natural rainbow moonstone cabochon gem in an oval shape measuring 30x17mm. This genuine moonstone jewelry design was handcrafted with an open back setting in 925 sterling silver. This genuine moonstone pendant is set with a very beautiful natural rainbow moonstone cabochon gem measuring 32x17mm. This genuine moonstone jewelry design was handcrafted with an open back setting in 925 sterling silver. This genuine moonstone pendant is set with a very beautiful natural rainbow moonstone cabochon gem measuring 30x19mm. This genuine moonstone jewelry design was handcrafted in 925 sterling silver. This unique moonstone pendant is set with a very beautiful natural rainbow moonstone cabochon gem measuring 37x17mm. This genuine moonstone jewelry design was handcrafted with an open back setting in 925 sterling silver. This extra-large size moonstone pendant is set with a superior Grade natural rainbow moonstone cabochon gem measuring 37x21mm and weighing 52 carats! This genuine moonstone jewelry design was handcrafted in 925 sterling silver. Genuine moonstone gem weighs 62 carats! This extra large size moonstone pendant is set with a leaf shape natural color moonstone cabochon gem measuring 44x24mm. 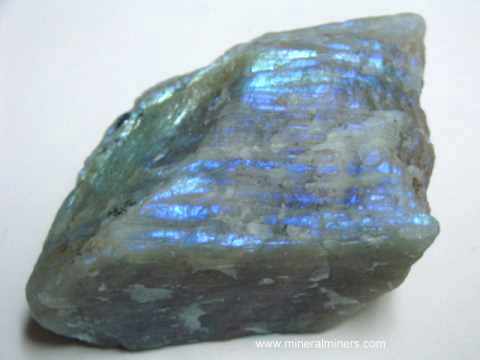 This superior quality gem has natural color blue and golden flashes of iridescent color. This unique moonstone jewelry design was handcrafted with an open back in 925 sterling silver. This unique moonstone pendant is set with a very beautiful natural rainbow moonstone cabochon gem measuring 48x32mm. This genuine moonstone jewelry design was handcrafted with an open back setting in 925 sterling silver. This natural moonstone pendant was handcrafted in 925 sterling silver and set with two genuine moonstone cabochon gems and with a genuine iolite gemstone. Each of these gems is unheated and untreated. The iolite gem is a 5mm round faceted iolite, and there is a 10x8mm pear shaped moonstone cabochon gem at the bottom with an 11x9mm oval moonstone cabochon gem at the top. This beautiful moonstone pendant was handcrafted in sterling silver and set with a faceted 9x6mm rectangular shaped gem of natural amethyst above a 12mm round cabochon gem of natural blue-flash moonstone. This genuine moonstone jewelry pendant was handcrafted in sterling silver and set with three cabochon gemstones of natural blue-flash moonstone measuring from 6mm in diameter up to 16x8mm. This genuine moonstone jewelry pendant was handcrafted in sterling silver and set with three cabochon gemstones of natural blue-flash moonstone measuring from 6mm in diameter up to 18x14mm. This wonderful moonstone pendant is set with four faceted gems of sky-blue topaz that measure from 5mm in diameter up to 9x6mm, and with a 20x15mm oval shaped natural blue moonstone cabochon gem. This genuine moonstone jewelry design was handcrafted in 925 sterling silver. This unique moonstone pendant was handcrafted in 925 sterling silver and set with a beautiful 16x12mm moonstone cabochon gem with natural blue flashes of color. It also is set with a 10x8mm faceted sky-blue topaz gemstone, and with a 7x5mm pear shaped genuine amethyst faceted gemstone. This large moonstone pendant was handcrafted in 925 sterling silver and set with a faceted 9x6mm sky-blue topaz gemstone and a natural rainbow moonstone cabochon gem measuring 24mm long x 17mm wide with beautiful blue and golden-green flashes of natural color! This large moonstone pendant was hand-crafted in 925 sterling silver and set with two different shaped cabochon gemstones of 100% natural rainbow & blue-flash moonstone, and with a 14x11mm cushion cut faceted gemstone of natural amethyst. This extra large size multi-gem moonstone jewelry design was hand-crafted in 925 sterling silver and set with a 16x12mm oval shaped cabochon gemstone of natural rainbow moonstone, two small 5mm round faceted natural amethyst gemstones, an 11x8mm oval faceted natural amethyst gemstone, and an 8x6mm sky-blue topaz faceted gemstone! This unique moonstone pendant is center set with a 25x14mm oval shape natural color moonstone cabochon gem with deep blue flashes of irridecent color surrounded by a combination of 7mm round rainbow moonstone cabochons and with eight 5mm round faceted gems of golden citrine! This extra large size moonstone jewelry design is 3.3 inches long! It was handcrafted with open back settings in 925 sterling silver with a very large bale that will fit on an 11mm round necklace. This unique rainbow moonstone pendant was handcrafted in sterling silver and set with a free-form shaped 35x16mm cabochon gemstone of natural rainbow moonstone. This extra large size moonstone jewelry pendant is also set with a 10mm square cushion cut sky blue topaz gemstone with a checkerboard faceted top! This unique moonstone pendant is 2.5 inches long! It is set at the bottom with a large natural color pear shaped rainbow moonstone cabochon gem measuring 33x16mm. This one-of-a-kind pendant is also set with an 8x6mm rectangular shaped faceted gem of sky-blue topaz, which is set on each side with a faceted 9x6mm pear shape gem of natural amethyst. This beautiful moonstone pendant was hand-crafted in 925 sterling silver and set with a large size oval shaped cabochon gem of natural color blue and golden-green rainbow moonstone measuring 31x20mm. This large size moonstone jewelry pendant was then set with twelve natural iolite faceted gemstones with rich blue-purple natural color each measuring 4mm in diameter! This unique moonstone pendant was hand-crafted in 925 sterling silver and set with a large size oval shaped cabochon gem of natural color blue flash moonstone measuring 21x14mm, and also with two smaller 9x7mm blue-flash moonstone gems. These three moonstone gems are completely natural - they have not been heated or treated in any way. this large size moonstone jewelry design will make a wonderful moonstone necklace! See also another view of this natural moonstone pendant. This unique moonstone jewelry design was handcrafted in 925 sterling silver with a very large bale that will on a very large necklace! This extra large size genuine moonstone pendant is set at its center with a 27x20mm oval shape natural rainbow moonstone gem weighing 37 carats! Below the moonstone is set a faceted 14x11mm pear shape amethyst gem weighing 6 carats, and up above is a faceted 15x11mm oval shape gem of beautiful golden citrine weighing 7 carats! 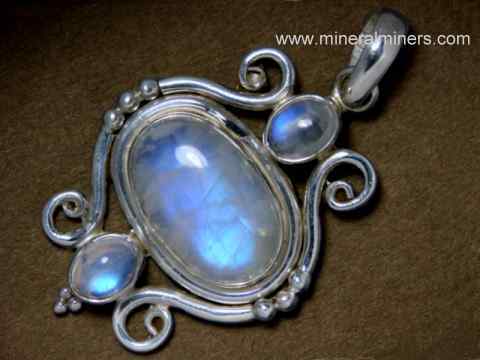 This ex-large moonstone jewelry pendant measures 3.8 inches long! This amazing pendant was hand-crafted in sterling silver and set with a 33x22mm oval shape natural blue-flash moonstone cabochon gem and with a 16x15mm natural rainbow moonstone tongue shape cabochon gem. There are also two 6mm round natural pink tourmaline (also known as rubellite tourmaline) cabochon gemstones and one 23x11mm marquis shape cabochon gem of natural amethyst! The photo at left was taken under incandescent light. This unique moonstone pendant is set with a 22x9mm rectangular shape rainbow moonstone cabochon gem and with two smaller cabochon gems of natural color aquamarine. 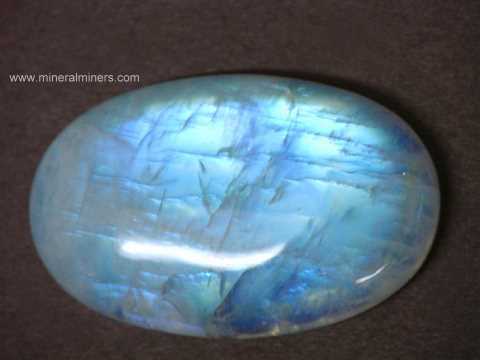 The natural color moonstone gem has wonderful flashes of gold, green and blue iridescent color. This large moonstone jewelry design was handcrafted with open back settings in 925 sterling silver with a very large bale that will fit on an 11mm round necklace. See also a side view of this handcrafted moonstone with aquamarine pendant. This lovely moonstone pendant is set with two natural moonstone cabochon gems - a 14x10mm pear shape and an 8x6mm oval. This genuine moonstone jewelry design was handcrafted in sterling silver. This lovely moonstone pendant is set with ten marquis shape natural blue-flash moonstone and rainbow moonstone cabochon gems measuring 10x5mm, and with a larger 19x10mm marquis shape natural rainbow moonstone cabochon gem in the center. This natural moonstone multi-gem pendant will make a beautiful moonstone necklace! This genuine moonstone jewelry design was crafted entirely by hand with open back settings in 925 sterling silver. This large sterling silver moonstone pendant is set with three genuine moonstone cabochon gems (natural moonstone); a 13mm round, a 22x10mm marquise, and an 18x10mm pear shape. This genuine moonstone jewelry design was handcrafted in sterling silver. This large size moonstone pendant is 2.4 inches long, it will make a very beautiful moonstone necklace! This genuine moonstone pendant was hand-crafted in 925 sterling silver and set with two large natural color moonstone gems; a 24x15mm oval shape moonstone cabochon gem, and a 21x12mm pear shape moonstone cabochon gem. This extra large moonstone pendant is 2.7 inches long! It is set in 925 sterling silver with three natural moonstone cabochon gems measuring 11x9mm, 14x10mm, and 15x11mm. This large pendant will make a wonderful moonstone necklace! This genuine moonstone jewelry design was handcrafted in sterling silver. This extra-large size natural moonstone pendant is set with eight natural moonstone cabochon gems measuring from 9x7mm up to 20x15mm. This genuine moonstone jewelry design was handcrafted in 925 sterling silver. This natural color moonstone sterling silver pendant was hand-crafted and set with a 23x16mm moonstone cabochon gem (natural moonstone) beneath a pair of beautiful light pink natural color 8x6mm rubellite tourmaline cabochon gems and a 10x8mm deep green natural color tourmaline cabochon gem. This natural color moonstone sterling silver pendant was hand-crafted and set with a 28x18mm moonstone cabochon gem (natural moonstone) beneath a pair of dark green natural color 8x6mm green tourmaline cabochon gems and an 11x9mm deep sunset (dark cranberry color) natural color tourmaline cabochon gem. The gem in this fine quality cats eye moonstone necklace weighs 33 carats! This genuine cats eye moonstone pendant was hand-crafted in sterling silver with an open back setting and set with a fine quality untreated gem of natural color cats eye moonstone weighing 33 carats. 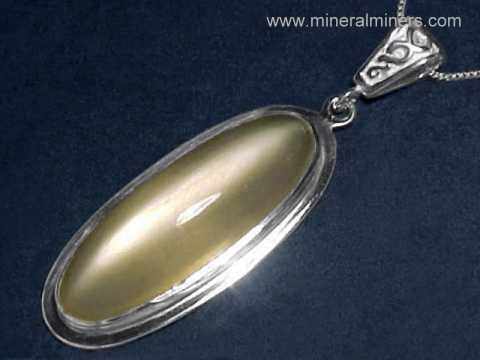 The 37x13mm oval shape cabochon gem in this large size natural moonstone jewelry design was hand-ground & polished from natural moonstone rough that was mined in India. This beautiful moonstone pendant is displayed on a sterling silver necklace that measures 18" long which is included with the pendant at no extra charge. See also a side view of this natural catseye moonstone jewelry design. This natural pink tourmaline crystal pendant is set in 925 sterling silver together with a 5mm round natural moonstone gem! The genuine pink tourmaline crystal section is completely natural and it is 3/8 inch long (10mm long). The pink tourmaline is transparent with faint natural inclusions and 100% natural color; this pink tourmaline crystal pendant is unheated and untreated. This natural pink tourmaline crystal pendant matches nicely with our handcrafted pink tourmaline crystal earrings! Our Moonstone Jewelry designs are all natural untreated moonstone jewelry! 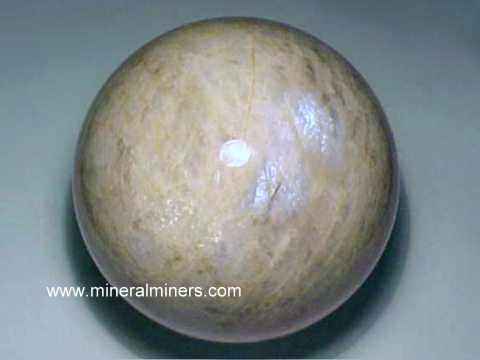 Below you will find links and information regarding moonstone and other natural minerals in our inventory. We have a large assortment of moonstone jewelry items in stock including moonstone pendants, rings, moonstone bracelets, necklaces and moonstone earrings. Each of these genuine moonstone jewelry items is set in a handcrafted design in pure 925 sterling silver. We receive large shipments of unique moonstone jewelry items several times per year, so be sure to bookmark this page and check back frequently. You can also contact us by email with any moonstone jewelry requests. 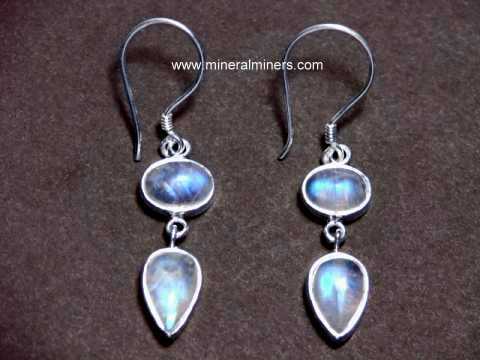 Just let us know if you would like to be contacted by email when we add more natural moonstone jewelry on this page. 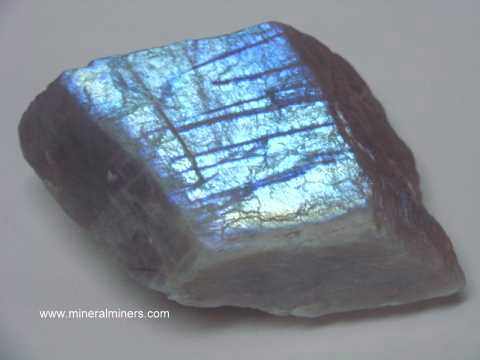 Please see the links below for natural moonstone items including moonstone gems! See also our pages displaying some additional rare gem feldspar varieties like sunstone and labradorite. 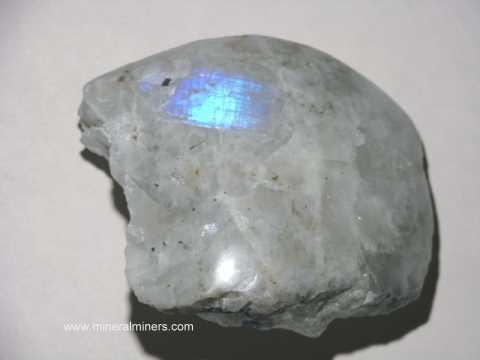 For more information about natural moonstone and its history, physical properties, chemistry, occurance, and metaphysical uses be sure to see our moonstone information page. Every one of our moonstone jewelry items is set with untreated natural moonstone gemstones! Our moonstone jewelry designs are available with cabochon gemstones. Each of the gems in our moonstone jewelry items was hand ground and polished from natural moonstone rough that was mined in India or Africa. We have a large selection of beautiful moonstone jewelry designs set in genuine sterling silver in a variety of sizes and shapes in moonstone rings, moonstone pendants, moonstone bracelets, and moonstone necklaces. See also our natural gemstone jewelry pages displaying Amethyst Jewelry, our Larimar Jewelry, and our Blue Topaz Jewelry. We also have genuine Pearl Jewelry in stock, and a large selection of the recently discovered natural Ethiopian Opal Jewelry! See our selection of genuine black onyx jewelry in handcrafted pendants, bracelets and necklaces. Be sure to see our jewelry pages for the unusual feldspar varieties like natural labradorite jewelry and our natural sunstone jewelry page. We have been working with natural moonstone for over 30 years, and we have a large inventory of genuine moonstone items in stock! We offer genuine moonstones that were mined in Africa and in India with moonstone rough specimens, polished pieces, jewelry items, cabochon gems, and handcrafted spheres. Be sure to let us know if you have any natural moonstone requests. 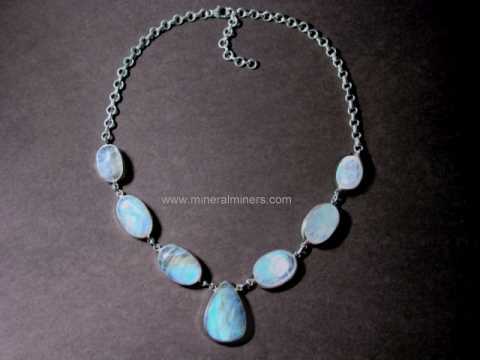 Would you like us to inform you when we add on this page more moonstone jewelry? We do have a large inventory of moonstone jewelry in stock so be sure to let us know if you have any moonstone jewelry requests. Please contact our webmaster, about moonstone jewelry or our 'site' geologist with any moonstone jewelry questions or comments. 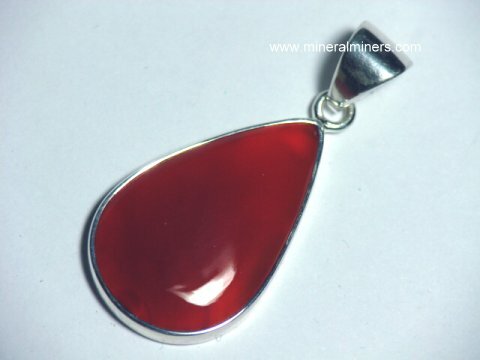 We also have many other kinds of natural gemstone jewelry items available. In addition to our genuine moonstone jewelry items displayed above, we also have genuine emerald jewelry, aquamarine jewelry, and our genuine opal jewelry designs with a variety of beautiful opal gems including natural Ethiopian opal jewelry and natural Australian boulder opal jewelry. Our natural agate jewelry is available in several different agate varieties including genuine lace agate jewelry, genuine fire agate jewelry, and genuine moss agate jewelry, and we also have wonderful banded agate jewelry designs in bracelets, necklaces, rings and pendants. We have a variety of styles and sizes available in natural garnet jewelry items as well in several different rare garnet varieties including genuine tsavorite jewelry and genuine mandarin spessartite jewelry. Be sure to check out our page listing all of the gemstone jewelry varieties that we offer! See the links below for a selection of unique hand-crafted gemstone jewelry designs.